Becky poses with her certificate by the State Records Collection in the Archives stacks. During the month of March, the Van Pelt and Opie Library hosts the annual Student Awards for all the student assistants in the library. This year’s event took place on Wednesday, March 21 and it included delicious food and a festive awards ceremony, which offered awards in eight categories. We are pleased to announce that both of our student assistants won awards! This student continues to excel and embody all the characteristics of an exceptional worker. 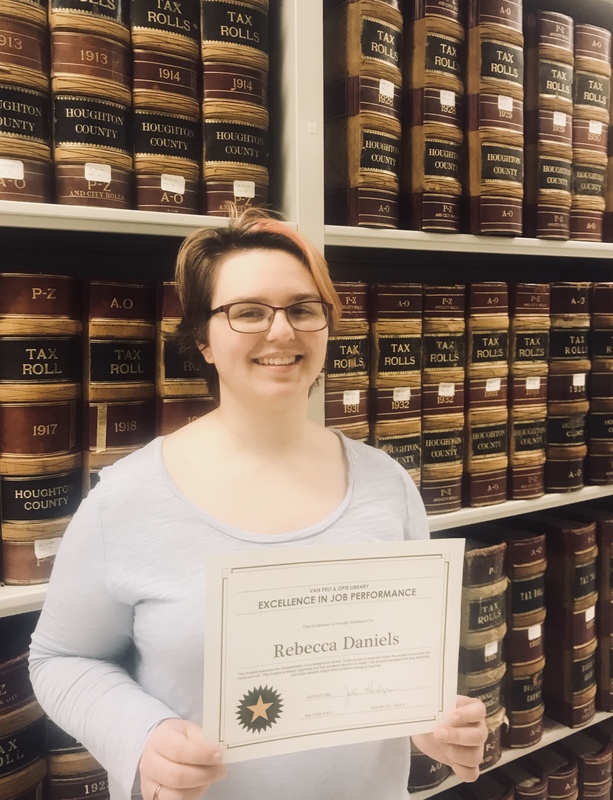 This student consistently receives rave reviews from colleagues in the department and continues to positively impact our customer service in the department. This student turns in nearly all projects ahead of schedule and provides work that transcends that quality of normal student work. For instance, I asked for some assistance on some research and the student was able to finish several complex research tasks in a 2-hour shift, work that would normally take another student assistant at least 3 hours. In addition, this student takes initiative on research projects by anticipating patron needs and working with the supervisor to make sure no stone is left unturned. This student’s writing skills are equal to their research skills and I cannot imagine our department without this student! The quality and excellence of work projects, the care and attention to detail, and the constant cheerful demeanor set this student a cut above the rest! Jeremy poses by MS-080: Copper Range Collection, which has been the main collection he has worked with to build the railroad exhibit. This student has gone above and beyond on a complex research project related to a grant-funded exhibit. This student provided accurate and timely research on a lesser known but historically important part of our local heritage. This student’s research findings are being applied to an exhibit project which will not only be on display in the Library, but will eventually travel off-site to other institutions. The student for this project maintained clear and consistent communication with the project team leader and was also able to earn the praise of project consultants and stakeholders interested in the project outcomes. In addition to achieving great research outcomes on this difficult and time-consuming project, the student was in a class of his own when it comes to positive attitude and enthusiasm. Not a day would go by without this student bringing joy and verve to research along with specific subject knowledge expertise which was directly beneficial to the project. This student has made this difficult project fun and informative. I always look forward to this student being in the department! Thank you Jeremy for all of your efforts! You are a wonderful part of the archives team! 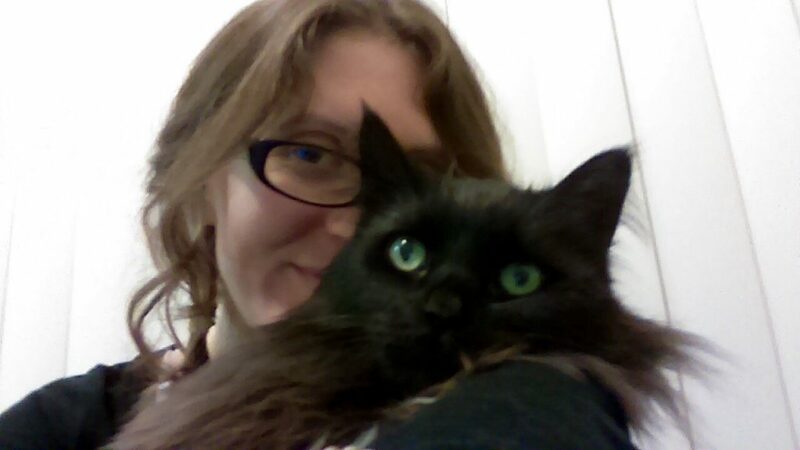 Allyse and her cat, Mr. Basil. Where are you from? I’m straight-up local. What is your major: Psychology, with a mix of everything else. 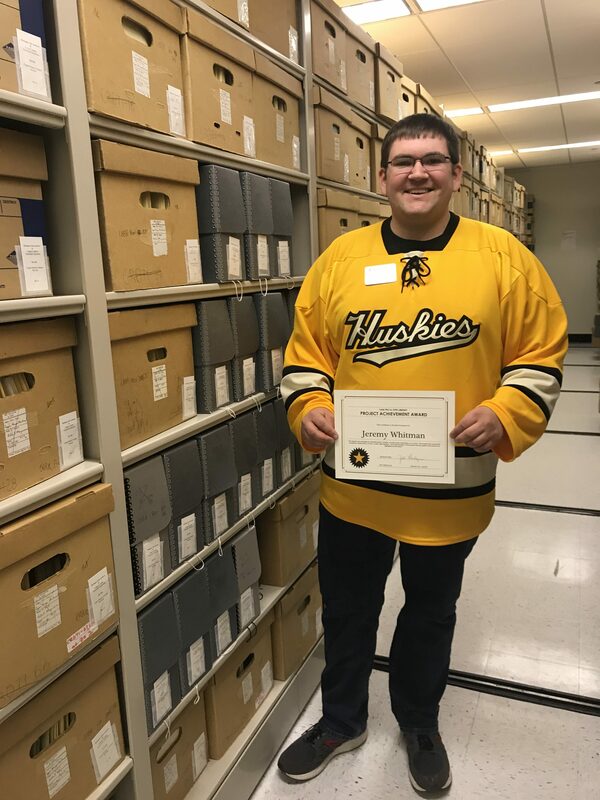 What is your favorite thing about working at the Michigan Tech Archives? Besides the delightful crew we have here? We connect our patrons with their long-lost relatives. The excitement they feel when discovering information about their families is so heartfelt to me! What is the most interesting thing you learned while working here? There is always something new and neat to learn! Never a dull moment. 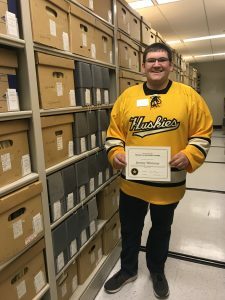 Why are the Michigan Tech Archives important to you? The fact that we aim to maintain Copper Country and Michigan Tech historical resources, and that we share these resources with the public, is very important! I’m happy to be a part of such a great and community-minded repository. Here is the second installment of our student assistant written blog entry about our Mine Memories Oral History Project. After we figured out how we could best set up our interview space, we were able to start recording interviews. Of course, I was nervous, but at the same time I was excited to hear what our interviewees had to say about their experiences. Our first interview went smoothly, there were no interruptions and next to no unwanted sounds on the recording. Our first interviewee was a historian, so it was really very interesting hearing things from both his personal and historical perspective. Our next interviewee, who actually worked for a local mining company, provided a completely different point of view on the time. We have interviewed seven people so far, and no two stories are the same. It has been an amazing journey, hearing all of these different perspectives on the same topic, and a topic that has had such a huge impact on the local region. Hearing people tell these stories is one thing, but to hear them and to realize how huge of an impact working in or around the mines has caused in their lives, is kind of mind blowing. The other day I was walking down along the portage by the Portage Lake District Library, and saw a mural of what Houghton could have looked like back in the mining days. There were also depictions of one of the mines that I’ve heard so much about and an image of a possible housing situation for the miners. It was incredible to be able to point out what I’ve heard during the interviews and be capable to look at these images and tell some of the stories that I’ve been hearing. It has been an incredible opportunity to work on this project and with all of these wonderful people, I can’t wait to come back from my summer break and continue working on these interviews. If you have any questions about this project, or if you would like to share your mine-related histories, please contact the Michigan Tech Archives at copper@mtu.edu or at 906-487-2505. 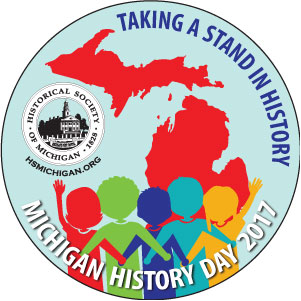 The Mine Memories project is funded in part by a Heritage Grant from the Keweenaw National Historical Park Advisory Commission.